The agency is continuously pushing towards greater transparency, creating a more efficient process for our customers while maintaining accountability for our residents, visitors and those who conduct business in the District. Over the past few months, we have ignited many initiatives to make doing business with DCRA efficient and effective. Understanding that it takes a team effort to ensure that our neighborhoods are safe and strong, the agency was excited to have our own Mayor Muriel Bowser visit for DCRA week. While here, we were able to dig deep into our operations and find ways to better serve District residents. Mayor Bowser was able to observe many divisional successes while also helping with some of the challenges we are faced with. You may have seen that Mayor Bowser highlighted several DCRA-related proposals in her fall legislative agenda. As a part of that, the Mayor proposed the “Department of Consumer and Regulatory Affairs Community Partnership Amendment Act of 2016.” The proposed legislation would improve the lives of District residents in three significant ways. First, the legislation would create an exemption from DCRA business license requirements for de minimis business activity, so that businesses like lemonade stands or a youth team’s car wash can operate without the need for a license. Second, the bill would require landlords to maintain and post a 24-hour phone number for tenant reports in a visible place, so that tenants will always know how to get in touch with their landlords if a repair is needed. Third, the proposed legislation would clarify that only a property owner, his/her agent, or a relative may register a property as vacant. This will help to ensure that no one’s property is incorrectly classified, while still allowing anyone concerned about a property to report it directly to DCRA. As part of the Mayor’s legislative agenda, DCRA will also be proposing a rulemaking to allow one-family rentals to self-certify that their property meets housing code requirements as an alternative to obtaining a DCRA inspection. Inspections would still be available to anyone who requests them. The DCRA-related items in the Mayor’s agenda would simplify licensing requirements, protect renters from unsafe conditions, and help homeowners avoid undue increases in their mortgages. We look forward to discussing the proposals at an upcoming public hearing before Council. Working together with our local government agencies and alongside Mayor Bowser’s office is a sure way of improved services for our District. Regulatory bytes for the data junkie. This is your centralized data section of the newsletter to access permit issuance information in seven different categories for all eight wards across the District. We hope these stats provide a better insight into developments happening in and around your respective communities. Please stay tuned for data related to enforcement and business licensing activities to be released in future editions. *A General Business license applies to all businesses that have a tax identification number, and perform business activity that is not licensed under another basic business license endorsement category, and is comprised of principals who are not required to maintain licenses granted or regulated by local, state, or national certification board or body. Keeping your ear to the DCRA streets. 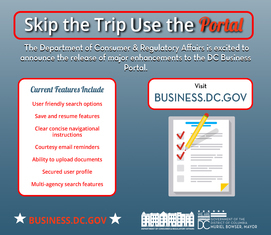 As the Mayor said, “the best trip you will have to DCRA is the one you won’t have to make.” So Skip the Trip and Use the Portal at business.dc.gov. See images from the launch here. DCRA was keenly aware that the Online Building Permit Application Tracking (OBPAT) function was critical to its public users. The agency’s commitment to transparency and providing accurate information to the public was just as vital to DCRA’s Director, Melinda Bolling, so she made it a priority to resolve integrity issues and restored OBPAT. The improved OBPAT makes easily accessible and reliable permit information available to the public. OBPAT allows users to identify all permits quickly for an address or parcel, helps to ensure that nothing falls through the cracks, and that permits progress steadily through the review process. Although the permit status tracker is back online, the agency continues to provide information about properties and permits in Property Information Verification System (PIVS). If you have questions about issued permits, licensure, or property ownership, PIVS can often answer them. If you want to know whether nearby construction work has been permitted, please search by property address. If you believe that you have observed illegal construction, please contact DCRA’s illegal construction line at 202-442-STOP. We are pleased to offer our customers and stakeholders as well as other District government agencies a quick and easy way to request assistance from DCRA. DCRA implemented the big green #EasyInfo Button on its website for quick and easy access to customer support. #EasyInfo Button requests are routed through DCRA’s Customer Service Team. Whether you’re looking for information on permitting, licensing, or anything else about DCRA, just click the button for easy access to the answer. After users click the button, they will be led to a short, web-based form to send in their question. The Customer Service Team takes ownership of all requests, no matter what request, assistance or service a customer is seeking and assures that the appropriate DCRA employee responds within a reasonable amount of time. DCRA’s Customer Service Team is trained to respond to any request or concern that arises, building a solid DCRA-customer partnership throughout the life cycle of your request, and is committed to delivering the highest quality of customer support in the District. Our team may be reached by clicking the #EasyInfo Button on the agency’s webpage, 8:15 am through 4:45 pm, Monday through Friday, and Thursdays 9:30 am to 4:45 pm. The new #EasyInfo Button and form are available on desktop and mobile devices, so website visitors can quickly and easily ask the agency a question from wherever they are—anytime, day or night. In July, DCRA launched enhanced customer-facing ProjectDox features that offer more notifications at key milestones during the plan review process. Additionally, applicants are now able to delete files during the document uploading phase. Internal enhancements were implemented to the electronic plan submission and review software to allow DCRA staff the freedom to assign and reassign projects as necessary to complete the review successfully. An automatic stamp will be placed on every page and serves as the batch approval stamp for approved plans issued by DCRA. This stamp enhancement reduces the amount of time each reviewer handles the drawings. These new enhancements affect all new projects submitted on, or after, July 25, 2016. For more on these ProjectDox Enhancements, please visit http://wp.me/p6XILc-Z. 4. List various plan review designations and understand how they are assigned. The next Green Code training on Commercial Energy Code/Lighting to AIA|DC will take place on October 24, 2016. The Green Building Division hosts bi-weekly hands-on workshop designed for permit applicants who have submitted for building permit and are pending or have already received “energy review” comments. At the workshop, DCRA’s residential energy code reviewers will be on hand to address review comments. The next workshop will be held on Tuesday, October 4, 2016. Click here to view a list of Green Building events and trainings. On September 21, 2016, the Green Building Program conducted a LEED Accredited Professional: Building Design and Construction Part II. A LEED credential gives builders a competitive advantage and credibility to bring success to LEED projects and sustainability-focused organizations. The key to earning a LEED Accredited Professional: Building Design and Construction credential is a thorough understanding of green building and the LEED rating system as well as the ability to facilitate the certification process. LEED AP credential arms you with advanced knowledge in green building as well as expertise in the LEED AP: BD+C rating system. Participants that took this course were provided background to take and pass the LEED AP: BD+C Exam, which tests knowledge of the requirements and calculations required for green building practices for both commercial and residential spaces and both new construction and existing buildings as well as how to support other professionals working on LEED projects. DCRA is proposing to revise current versions of the Certificate of Occupancy (C of O) application and checklist to reflect current code cycles, review processes, and simplifying format. Additionally, to responding to current life safety issues related to Conditional Certificates of Occupancy (CCO), the existing Conditional Certificate of Occupancy Guidelines of Issuance are being updated to reflect the current code and a new checklist has been developed to assist applicants when applying for this type of C of O.
Transparency has been the focus behind the communications with our stakeholders regarding these changes. DCRA has encouraged stakeholders to provide feedback by via an online survey, as well as hosted two open houses during the summer to allow an open dialogue about the proposed changes. In October, DCRA will be hosting an additional three open houses for Expediter, Designers, and Architecture groups. For more information, please see the You're Invited event section below. Feedback from both the survey and the meetings have been considered and will be applied to the proposed changes to be implemented. To learn more about the proposed changes and why the change is necessary, please view a copy of this presentation. On September 23, 2016, the Municipal Government of Shanghai visited DCRA to learn more about our agency and how we regulate business in the District. The delegation was specifically interested in learning how we set up codes, approve permits, issue businesses licenses, register corporations, and inspect on a regular basis. The delegation was given a tour of the facility and a presentation on our policies and procedures. See pictures of the visit here. On September 27, 2016, a panel of students served as panelist discussing the benefits of them participating in the Department of Consumer and Regulatory Affairs Pre-Apprenticeship Program. The purpose of this six week internship program is to provide specific building code compliance training instruction to juniors and senior high school students in basic code fundamentals of the International Residential code. The goal of the program is to allow District junior and senior high school students to become exposed to the trade and engineering curricula through classroom instruction, field shadowing, and professional. 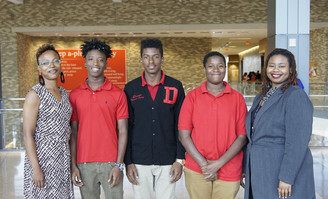 The most exciting part of the program is that the students get the excellent opportunity to begin a rewarding career that is a Pathway to the Middle Class by earning a vocational certificate along with earning a high school diploma and work towards the international Code Council (ICC) Certificate in a specific technical discipline. See pictures of the event here. DCRA’s Wellness Program’s main focus is on the five key values for their employees: finance, physical, mental, social, and communal. As a part of the community engagement thrust, DCRACares builds partnerships with and gives back to the community in which we work in. As a part of the DCRA Wellness Program initiative, DCRACares collected and donated over 125 uniforms and six boxes of school supplies to Amidon-Bowen Elementary School in Southwest DC on September 15, 2016 for their DCRACares Season of Giving School Supply Drive 2016. See pictures of the supply drive here. Additionally, during Child Abuse Prevention Month, the Wellness Program initiated a pinwheel garden named “Pinwheel for Prevention” in support of the protection of children. The Wellness Program also does toy drives and participates with the Food Bank. Your social calendar to DCRA's world. We'd love to hear from you! Let us know if there is anything you would like to see in future newsletters by completing our short survey. If you have any questions regarding this newsletter, please contact us at (202) 442-9502.